Kenwood House is an excellent destination stop if you happen to be in London, England. Located off Hampstead Lane, it is an easily accessible tourist site just a little ways off from the junction of the A1 and A4 at Highgate. A visitor could also walk from Hampstead Heath, heading north through Kenwood. The site is a wonderful historic 18th century home, once owned by the beer mangnate Edward Guiness. It is filled with rich, luxurious interior and décor, including costumes and textiles. Beautiful portraits of Elizabethan ladies, the ladies of the Stuart line, kings and noblemen decorate the walls inside. It is also filled with paintings from the Suffolk collection, which offers 41 paintings from artists such as Rembrant, Turner, and Reynolds. These come from the 11th Countess of Suffolk, who ordered the family collection to be given to the nation. These artworks are displayed on the first floor of the Kenwood House. The house also contains a fantastic collection of Scottish furniture bought after a sale of objects from Scone Palace, the Mansfield's Scottish home. This purchase returned many of the 18th and 19th century family furnishings to Kenwood, including tableware, chairs, and a portrait by Sir Peter Lely. Unfortunately, from the summer of 2012 until sometime in 2013, Kenwood House will be closed to the public for renovations. These renovations include new roofing, as well as patches, gutters and skylight work. This will ensure that the house is structurally sound for many years to come, and will adequately protect the treasures within. However, the beautiful gardens and grounds, which are in themselves a popular destination, will be open during the house renovations. In the gardens, you can also visit the Brewhouse Cafe. 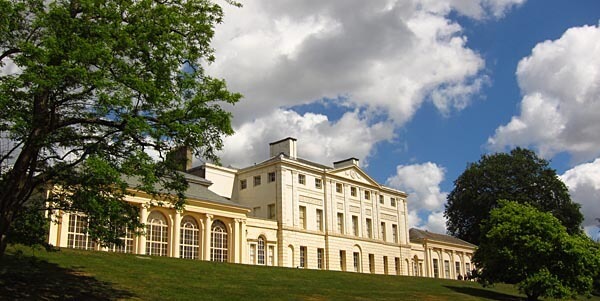 Kenwood House sits upon an amazing 112 acres, and is landscaped in 18th century fashion. The property sits on a high hill with offers incredible views of London, while offering a country ambiance. There is an immense amount of open space, but the property also includes designed paths around the estate that offer visitors some pleasant surprises. The natural woodlands on the property, the Kenwood, which represents a little under one-third of the total 112 acres, has been designated a Site of Special Scientific Interest due to how natural and intact these woodlands have been kept (possibly since before the 16th century). The estate offers a variety of open nature, from fields to wetlands, and has been a popular destination for artists over the years. Spring offers artists, photographers and nature-lovers wonderful blooming flowers such as magnolia trees, bluebells and rhododendrons. Those who enjoy the cooler weather of Fall are treated to a display of autumn leaves in purples, yellows and oranges. The house is closed for repairs through March 2013. Kenwood House's gardens are open from 7 am until dusk daily. The Brewhouse cafe is open 9 am to 5 pm. Last updated by jack on 05 June, 2012 in Destinations.